I was helping my second-grader with his homework; he was reluctant to read a the little copy-printed book on bartering, saying, with full eye-rolls, that he'd already read it. So we read it together, and worked through the questions at the end. Suddenly his eyes lit up. "You and dad barter!" he said. Exactly. Here in Portland, Ore., I am such a regular user of the barter economy that the book's historical viewpoint (first came bartering, and finally came malls) seems passé. The grocery co-op where we are member-owners holds an annual holiday barter swap, instead of a bazaar, and we look forward to the seed and start swap in the spring. On Portland's craigslist barter page, hundreds of offerings appear every day, and if it weren't for the constant request to trade something for an iPhone, you'd think it was 1972. "VHS copies of your favourite horror movies that you replaced on DVD this year for Tokyo Long Scarlet Radishes," reads one ad, also suggesting the trade of an old window for a 10-pound Fielderkraut cabbage. Estimates of the barter economy are, at best, wild guesses, but all involved agree that bartering goes up when the economy is going down, handily replacing some small fraction of the GDP with something entirely less gross. The International Reciprocal Trade Association puts the U.S. bartering economy at $20 billion a year, with 10% growth expected for 2009; and that's just between small businesses. Person-to-person bartering could be even bigger than that, because although the transaction size is surely smaller, the trades can be much more informal and spontaneous. 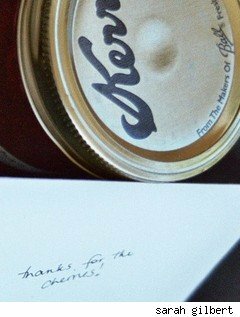 In the space of the last few months, for instance, I've traded sunflower seeds I harvested for homemade cookies; salsa for figs; strawberry jam for tart cherries; fig preserves for a bunch of canning jars; gardening for storage space; clothes that don't fit me for some that do; and currant jelly for hand-dyed yarn. While technically the IRS requires that you report all barter income on your tax return, the size of these transactions and the questionable market value (after all, I picked all those fruits myself, and they would have otherwise gone to the birds) means most of us are keeping the trades on the down-low. And, while in years past we may have just let the fruit fall to the ground and bought a jar of jam at the grocery store, with our tight budgets and increase in environmental consciousness, we're far more attentive to the goodness around us. I pick up interesting-looking jars from people's recycling containers; I ache when I see a fruit tree go un-harvested and knock on the door bearing jam. Friends can't bear just to bring perfectly good clothing and canning jars to Goodwill when they know I, or another cash-strapped family like ours, might be able to use it. A group of friends started a regular clothing swap we call "Naked Mama" parties a few years ago, and we all agree that we rarely shop any more, preferring to get the "new-to-me" high without the accompanying buyer's regret low. We're not alone; "Naked Lady" parties are so common there's a how-to and East Coast vs. West Coast rules (we're definitely left coast, what with our "throw it in a pile and have at it" style -- my friends are famous for grabbing good finds off other mamas' piles, umm, accidentally of course). More formal and hearkening from another bad economic time is the Yankee Swop, a 74-year-old service of Yankee Magazine. The folks at Swaptree have devised a service where bartering is far more open-ended. List an item with a UPC symbol (I guess homemade jam isn't an option), and bingo bango, the site's algorithms will find someone who wants it. You get to pick something you want, back, and you can ship it off to whoever wanted it, and wait to receive your book or CD or movie in return. And yes: it's really just media. No used size 8 1/2 shoes or long scarlet radishes here. But with the advent of Facebook and Twitter, and the heightened environmental and social-financial consciousness of our society, I've found bartering as easy as just talking about my day. That currant jelly-for-hand-dyed yarn trade? I just mentioned how many currants I was preserving, and a friend who makes beautiful yarn offered the swap. Another day, I mentioned how badly I needed someone to watch my children, and a friend replied to me via Twitter, saying she was coming over and all I had to do in return was share my shortbread. After I'd recommended his bike shop to other would-be bicyclists, a friend came over to fix a flat tire gratis. When it comes down to it, after all, bartering is really just sharing. And in our fundamentally changed economy, we're more attuned to the fact that we, our friends and neighbors and fellow planet-dwellers, just can't always make it on our own. "It takes a village," Hillary said, and yes: the village rules this economy. So get out there my fellow villagers. Write a resume for your neighbor in exchange for a kombucha baby. Ask for graphic design to trade for homemade bread. Gutter-cleaning for beer-brewing? Sewing for house-cleaning? Tomatoes for walnuts? The possibilities are endless and the upside is that, when you make a successful trade, both partners feel that their offerings are valued. Good feelings for good feelings? Perhaps this economy isn't so bad, after all.